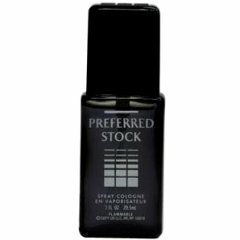 Preferred Stock (1990) (Cologne) is a popular perfume by Coty for men and was released in 1990. The scent is floral-green. The production was apparently discontinued. Every now and then one hears of someone discovering a masterpiece of art forgotten in an attic or in a second-hand store. When I was at Art School I heard tell of someone local, who had stumbled across a famous artist's painting in a second hand store. This is somewhat like my experience with Preferred Stock. Walmart is not known as being the centre of culture (unless it is a culture growing in agar in forensics lab); however since I visited America for the first time and went to Walmart there, to me the place is somewhat exotic (there are no Walmarts in Australia, where I live). It is at Walmart that I blind bought a two pack of Preferred Stock (for $14.84 US not including tax). I had heard that it was a worthwhile fragrance, for those who liked old school or powerhouse fragrances and so on this basis I bought the two 50ml bottles. I wish I had bought more. To say this is a great fragrance is an understatement and it easily 'blows away' 95% of my fragrance wardrobe. The scent is a citrus and lavender fragrance of great strength and pleasing longevity. Fans of Worth pour homme, English Blazer and other similar fragrances should love this one. It is clean, crisp and classy and has a simplicity that makes it a very 'honest' perfume. It is not pretentious and undoubtedly masculine. Write the first Review for Preferred Stock (1990) (Cologne)!